"Viscosity, Heavy Oils to Waste, Hazardous, Legislation"
" High acclaim from worldwide authoritative journals . . .an ambitious work indeed. . .a valuable addition to many college and industrial libraries. 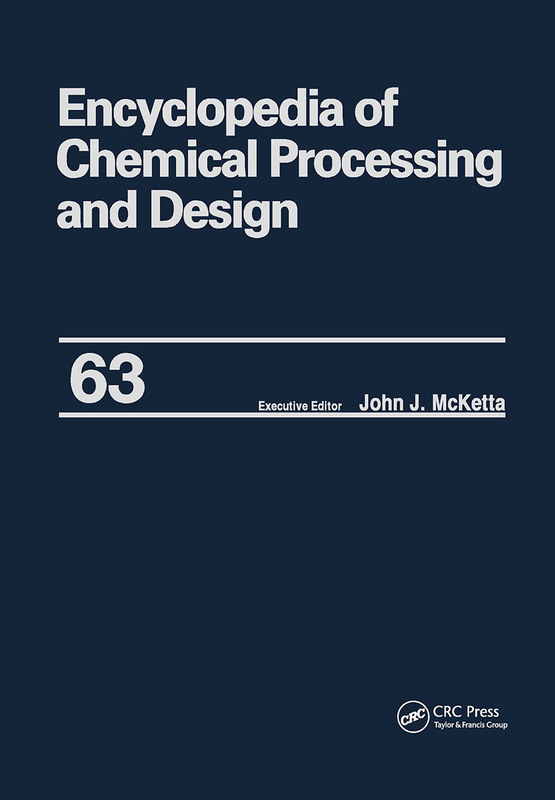 . . . . .highly recommend[ed]. . .to any student of the chemical process industries.. . .provides a valuable starting point for any specific design-related project. " "Conversion to SI Units Bringing Costs up to Date Viscosity, Heavy Oils, Adango Miadonye, Birbal Singh, and V. R. Puttagunta Viscosity, Heavy Oil and Bitumen, Adango Miadonye, Birbal Singh, and V. R. Puttagunta Viscosity, Hydrocarbon Vapors, JosJ Vicente Gomez Viscosity, Immiscible Liquid Mixtures, Adam Zanker Viscosity Index Calculation, Carlos G. Anaya and Oscar H. Bermudez Viscosity Liquids (355 Liquids), Carl L. Yaws, Xiaoyan Lin, and Li Bu Viscosity, Lube Oil Blends, Predictions, J. M. Al-Besharah, C. J. Mumford, S. A. Akashah, and O. Salman Viscosity, Lube Oil Streams, Estimation, Adam Zanker Viscosity, Prediction, Birbal Singh, V. R. Puttagunta, and Adango Miadonye Viscous Crudes, Pump Rating, Richard C. Doane Viscous Doughy Masses, Mixing, Norman H. Parker Viscous Liquids, Mixing, AndrJ Bakker and Lewis E. Gates Volatile Organic Compounds Control, Edward C. Moretti Volatile Organic Compounds Control, Above Ground Storage Tanks, Charlie Brown and Peter Dixon Volatile Organic Compounds, Catalytic Oxidation, Wilson Chu and Hassan Windawi Volatile Organic Compounds, Control Strategy, Edward N. Ruddy and Leigh Ann Carroll Volatile Organic Compounds, Controlling, Richard D. Ross Volatile Organic Compounds, Emissions from Maintenance Coatings, Roger E. Morgan Volatile Organic Compounds, Recovery via Adsorption, John Ruhl Volatile Organic Compounds, Removal via Biofiltration, Alan F. Rozich Volatile Organic Compounds, Removal via Incineration, John F. Straitz III Volatility of Gasolines, Environmental Interactions with Blending and Processing, George H. Unzelman Volume of Crude Distilled, Estimation, Abel Moreno, Maria del Consuelo Perez de Alba, and Leonardo Manriguez Volume, Specific, of Liquids, Accurate Calculations, Donald M. Haskell Volume, Specific, of Ethane-Propane Mixtures, Donald M. Haskell Volume and Weight of Piled Materials, Adam Zanker Waste Acids, Evan Jones Waste Brines, Dennis Anthony Waste Carbonaceous Material, Preparation and Evaluation of Adsorbants from, G. Q. Lu Waste Disposal, Incineration, Calvin R. Brunner Waste Disposal, Fluid Bed, John F. Mullen Waste from Distillation, Reduction, Robert W. Trebilcock, Joyce T. Finkle, and Thomas Dijulia Waste Energy Recovery from High Temperature Flue Gas in an Open Stack, Frank H. Wu and Donald Hurkot Waste Fuels, Handling Regulation, Thomas F. McGowan, George E. Lipinski, and Joseph J. Santoleri Waste Fuels, Value From, Richard T. Waibel and Roger K. Noble Waste, Hazardous, Contaminated Soil Testing, Joshua McKenna and Edward Pickering Waste, Hazardous, Facility Evaluation, Randy Roig Waste, Hazardous, Fungal Technologies for, R. A. Haimann Waste, Hazardous, Incineration, Thomas McGowan and Richard D. Ross Waste, Hazardous, Incineration, Oxygen Based Combustion, Prakash Acharya and Lloyd L. Schafer Waste, Hazardous, Legislation, Gerald B. Davenport "